Live music from Philip Joseph's Moonbuggy (radio, tape, synthesis),	Darkroom (electronic/acoustic improv), Peter Chilvers (Chapman Stick/ digital processing), Nemeton (Adrian Newton (aka Wacah Chan) structured minimal laptop electronics)	MC: Miss Roberts. Music from Os from Darkroom, Adrian Hopkins (solo guitar/effects), Rude Mechanicals, Dans Mon Salon and poetry from Robyn Moroney. Visuals/AV by ojovijo, Rude Mechanicals and Jo Brook. Music from Hot Chip, Rude Mechanicals and Dubmaster Deckhead, words by The Seamster. Visuals by Nick Evans. MC: Miss Roberts. Charlie Lewis (keyboard) with Marc Abraham (electronics): improvised interludes, Adrian Newton: haiku/digital processing, Paul and Tim from The Delta Family (fretless bass/electronics) with Dominic Lash (acoustic bass): improv, palmtop orchestra (palm pilots/samplers): digital improv/clicks/cuts), Ars'e Poetica (poetry). Improv session: Cos Chapman, Adrian Newton, Doug Nunn, Os, members of The Delta Family and palmtop orchestra (laptop, palms, sampler, fretless bass, analogue synthesizer, CD manipulation etc.). Slides/video by Nick Evans and Jo Brook. 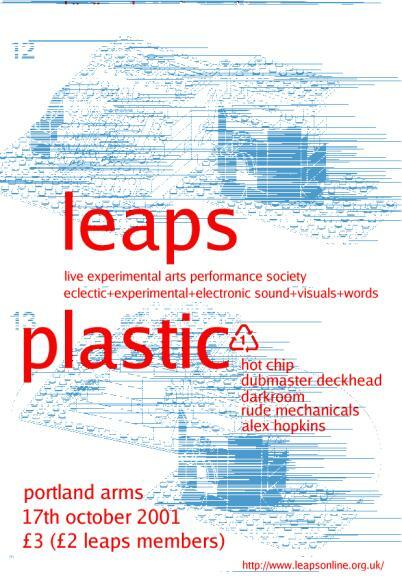 A festival of digital/analogue/audio/arts, experimental, electronic and eclectic music. Live music from Charlie Lewis, Showerhead, Darkroom, Captain Rokk, Pence Eleven, Um and Man From Uranus. Poetry performance from Robyn Moroney. Music/dance performance from Julie Jo Elle. Short films: Um/Tim Rowsell. Live music: Woodworks, Sad Sentimentals, Spicy Potatoes (Paddy and Sarah), Alistair, Cos and Jeremy (graphic folk set), Julie Jo Elle (spoken word), Peter Chilvers (Chapman Stick), Doug Nunn (hosepipe, OHP visuals), glitch djs low-tech interlude (clockwork radio, prepared music box, bubble wrap etc.). Hosted by Miss Roberts. Poetry from Robyn Moroney, live music from Pence Eleven, 3DM (Deliberately Diff'rent Dance Music), Darkroom, The Rude Mechanicals and Eggboy. Live visuals by Doug. Live music from Dans Mon Salon, The Delta Family, palmtop orchestra, The Rude Mechanicals, Woodworks and The Man From Uranus. Poetry from Robyn Moroney and Martin Figura. Visuals by Doug.